The animal by-products going through SBP processing are chicken frames which are minced and emulsified, chicken plucks (heart, liver and lungs), chicken necks, beef, lamb and pork. 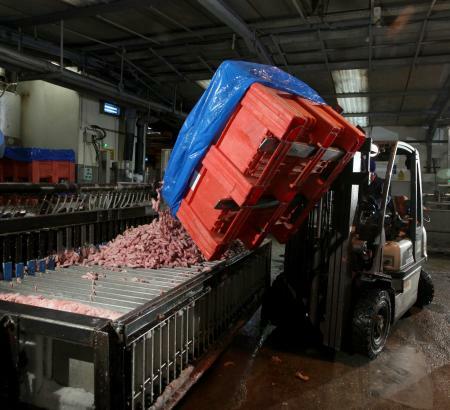 As part of the 'fifth quarter' the sale and processing animal by-products increases the value of animals being processed and reduces waste and the cost of waste disposal. 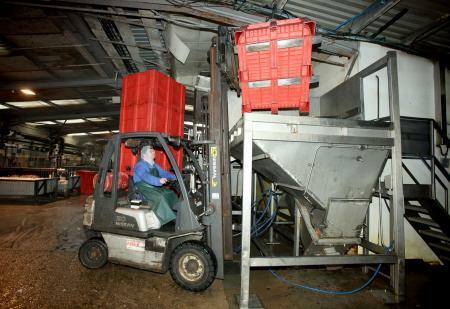 The other problem to overcome for SBP, as for the total sector is loss through non-return of box pallets. To help reduce loss, all new Dolav Ace boxes for Staffs Bye Products are hot die stamped by Dolav with the SBP company name. SBP pressure hoses its Dolavs clean and returns them to supplier sites in a continuous cycle as it has done for more than twenty years with Dolavs. For its pet-food company clients, SBP produces processed animal by-products to meet required specifications. That includes content and very importantly, hygiene to Cat 3 standards which SBP continues to achieve with the help of Dolav Ace pallet boxes.